Wow...all of this has really taken me out. I have had a horrible time with this sinus infection (I guess that is what it is?) and am still not feeling perfect. At least I am on the road to recovery, though. The problem is that I am catching so many things these days because my immune system is so bad after the round of really strong drugs I had to take while in the hospital with food poisoning in September. I don't think I would be coming down with all of this otherwise. So, my new goal is to boost my immune system--eat yogurt, sleep, eat healthily, exercise, etc. Anyway, that is that. During my recovery, I have read a couple of books: Marie Corelli's The Secret Power and Kresley Cole's Untouchable (in the volume Deep Kiss of Winter). I updated them to my Goodreads Challenge list, so I am 3 books (out of 50) into it. Yay! 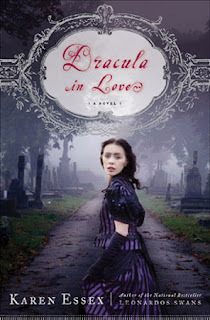 I am now reading Dracula in Love by Karen Essex. This is another one of those fabulous "bargain" buys I found on the discount aisle at Books-a-Million. It is a sequel/retelling of Dracula through the eyes of Mina. I had seen it before but was skeptical. Also, I never particularly loved Dracula to begin with (I find it tedious), but it was only $2.97, so I said, "Why not?" And am I ever glad that I bought it! It is very sensual and well-written so far. I was really surprised how it sucked me in (yes...I know...deliberately bad choice of phrase). I am not that far into it, but I LOVE it. I really need to get back to the dissertation, but until this medication gets out of my system and my head feels back to normal (the antibiotics are killing me), then I don't see the point. So, that is about it right now. For those of you who are regular readers, please pray for/send good thoughts out to my friend Elizabeth, who is fighting stage 4 cancer. She is having a really rough time and has been hospitalized, which, unfortunately, has stalled out her treatments for a while. So, keep her in your thoughts, please. Glad you're feeling better! Your friend is still in my prayers.